I’ve been thinking lately about comfort food. Probably because it’s winter, it’s cold outside, and comfort food usually warms you body and soul. 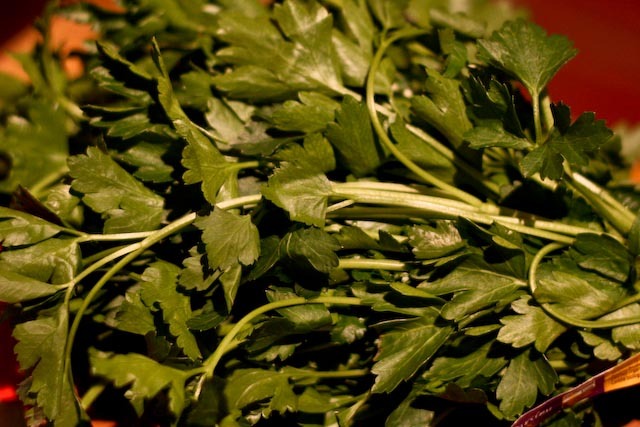 And apparently in 2012 comfort food is coming back into style at some of the top U.S. restaurants – who knew!? When I imagine comfort food, I generally picture baked mac n’ cheese, mashed potatoes, chicken pot pie, you know, the usual. But I thought a bit longer and decided that spaghetti and meatballs deserves it’s rightful place in the realm of comfort food. 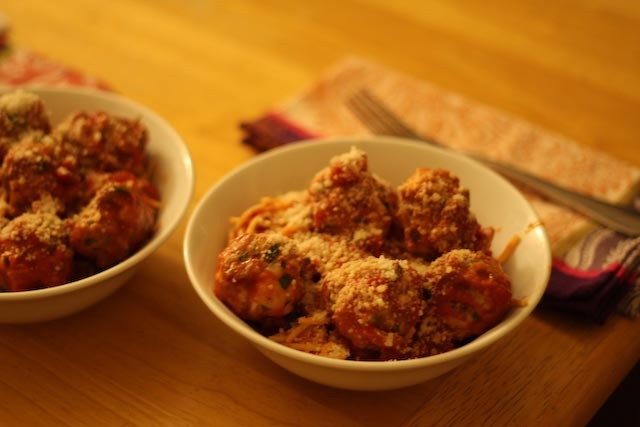 I sort of made up this meatball and sauce recipe, so I thought I’d share it with you. I hope you find it very comforting! 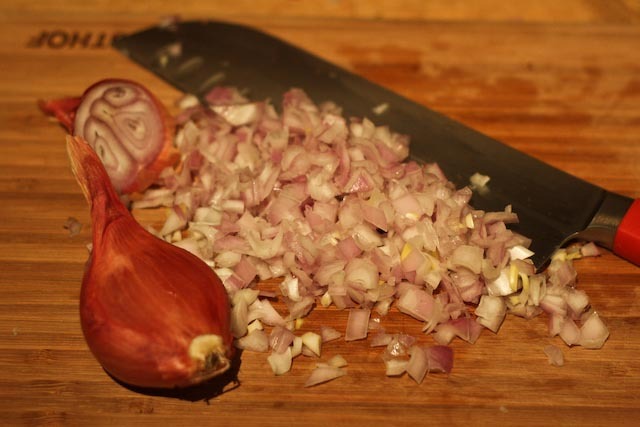 One thing that gives the meatballs lots and lots of flavor is chopped shallots – oh, and a few hefty cloves of garlic! I also added fresh herbs to both the pasta sauce and the meatballs. 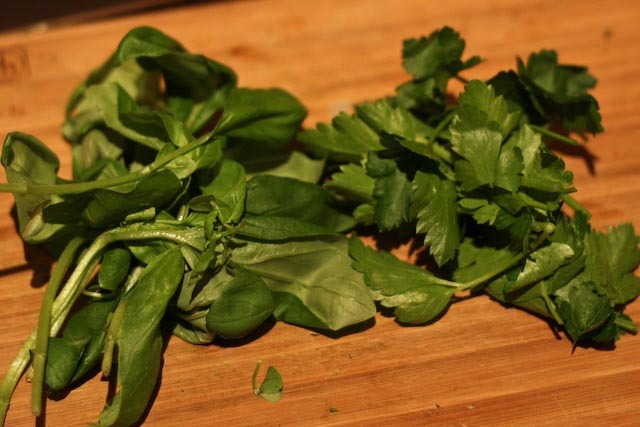 I used fresh basil and parsley, which I think add a lot of great flavor. 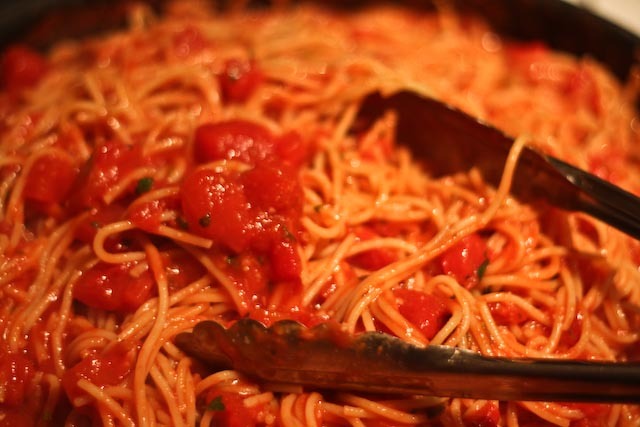 And there she be – gli spaghetti! 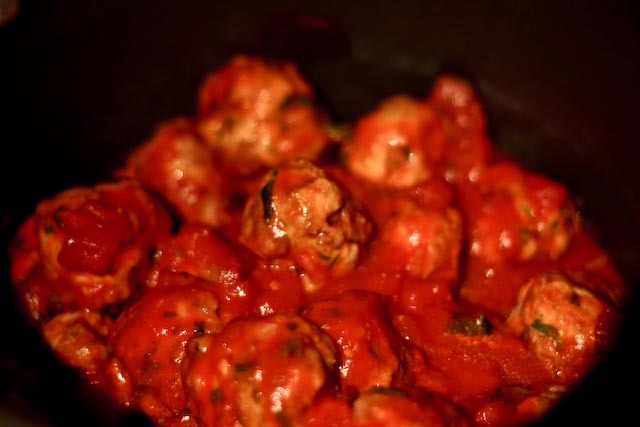 After broiling the meatballs for a few minutes, I add them to the sauce so they can pick up even more flavor. Since I like to really mix my pasta and sauce together well before I serve it, I opted to remove the meatballs from the sauce and set them aside so that I could add the pasta and really coat it with sauce. As with any pasta I make, I add a bit of pasta water and Parmesan cheese right into the sauce before adding the pasta and combining everything together. Of course, any comfort food has to include lots of cheese – so sprinkle your spaghetti and meatballs liberally with Parmesan! In a large bowl, combine the ground turkey and ground beef along with the eggs, bread crumbs, shallots, garlic, 1/4 c of the parsley, salt and pepper. Mix well using your hands or a large spoon, but avoid over mixing the meat. Start the broiler. 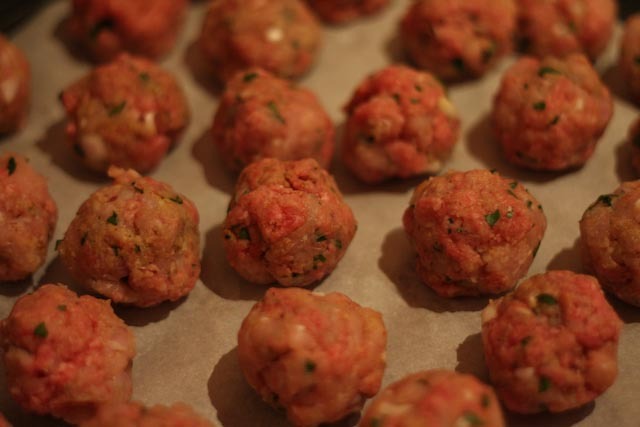 Scoop about two tablespoons of the meatball mixture and roll between your hands to form a ball. Place on a prepared baking sheet. Repeat with the rest of the meat (should make around 30 meatballs). Broil the meatballs on high for about 10 minutes or until they are just browned. Remove and set aside. Meanwhile, in a large, deep-sided skillet over medium heat, add the diced tomatoes, tomato sauce, tomato paste, and 1/4 c each of the parsley and basil. Season with salt and pepper. Cook the sauce, stirring occasionally, for about 20 minutes, until the flavors are well-melded (check your seasoning, as you may want to add a bit more salt). 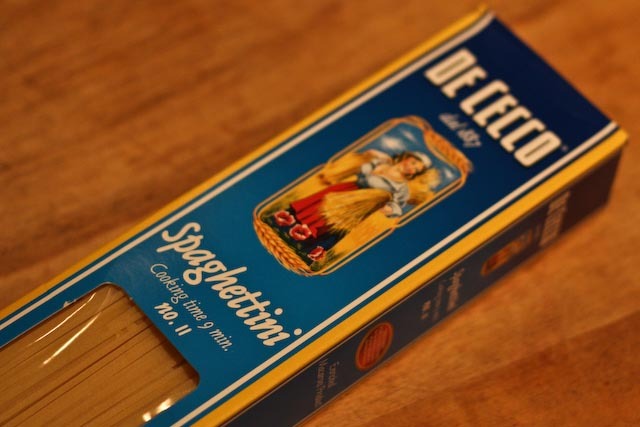 Meanwhile, cook the pasta according to package instructions. Reserve about 1/2 cup of the pasta water, and stir it into the sauce. 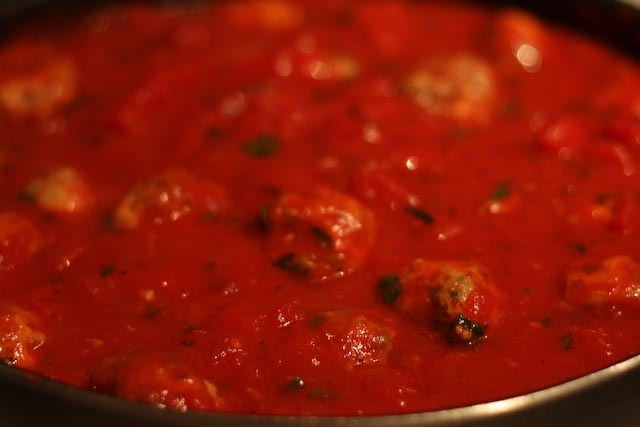 Carefully add the meatballs to the sauce, and stir gently to coat. Cover the pan and cook the meatballs for another 10 minutes, stirring a few times. Gently remove the meatballs from the sauce and set aside (covered). Add the cooked pasta and 1/2 cup Parmesan to the sauce and mix well. 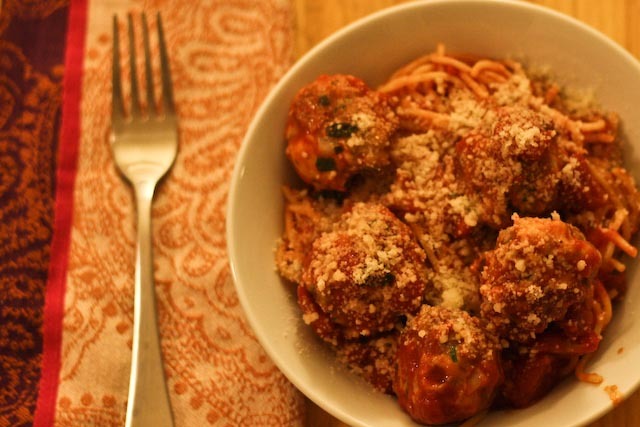 Serve the pasta in large bowls with about five meatballs per bowl. Sprinkle with additional Parmesan cheese.